Twinkle Little Store is currently CLOSED FOR ORDERS to the retail public until further notice. We hope to reopen our doors in mid-November 2003. We are taking this leave of absence to focus on family, to re-organise inventory and policies to serve you better, and pursue new and exciting directions to bring to our valued customers. Please join our mailing list to be notified of our re-opening clearance sale. Twinkle Little Star and PuddleCatchers wholesale programs for jewelry, cloth diapers and natural body care will continue to function as normal. Include them in your child's lunch bag to let them know how special they are to you. Send a set or give a few ovals to a pregnant friend, a new mom, or a friend who has just adopted a child. Let your friend know how very much she is appreciated. In a women's circle play charades, dance, or paint a message. Let the messages spark your imagination. Use the ovals as party favors for a birthday. Create special placecards for a dinner party. Enclose one or more ovals in a card to tell your grandmother how much you love her. Before your mom goes to bed, put a message on her pillow - Sweet Dreams! 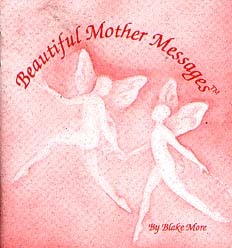 A celebration of the feminine spirit, these messages will inspire and uplift. Perfect for meditations or simply a beautiful way to star the day. A meaningful gift for the new mama, mama-to-be or even grandmama. This set comes packaged in a bag with a guidebook enclosed. Click on the book for a Sample Page. Beautiful, uplifting and inspiring messages from nature. Wonderful for daily meditations. The perfect way to regroup and recover from a day gone wrong. A great way to find that extra bit of patience and energy that parents so often need. Children also love these messages that spark their imaginations and lead to creative play. A wonderful idea for a rainy day : have your child draw a fairy message from a jar and try to enact it. 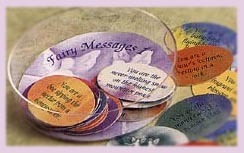 $7.50 CAD comes in a clear oval box containing 26 messages. upon the mountains like a flame. One of our fertility and mothering pendant necklaces? My daughter absolutely loves these little mesages. They are a great way to spark imaginative play. They are fun to tuck into school lunches as a surprise, or to lay on their pillow to find in the morning. Place them in a special place for your child to come upon. Be magical. More messages from nature. Send one in a letter to your friend. Include them in your invoices. Let visiting children choose one from a jar. Select one whenever you need a boost. Keep them at the office for coworkers to pick. A beautiful gift for a friend.